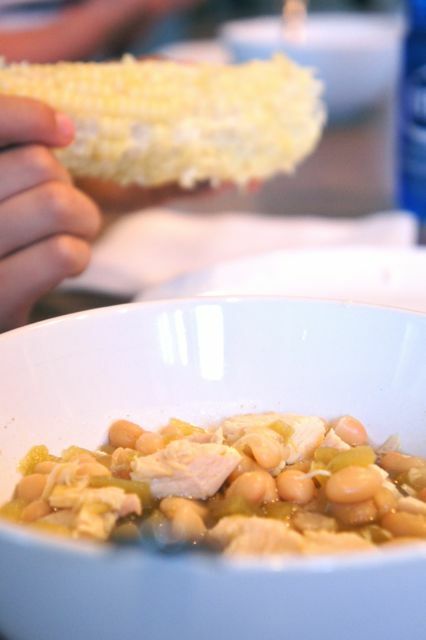 I've posted a longer recipe for White Bean Chili that was really good. But for those nights when you have 15 minutes to get something on the table, this is the recipe you want. I have made this lots of times, thanks to my friend Kate who brought it after my 1-year-old was born! I have served this with homemade cornbread (there is almost nothing better! ), but this time I served it with corn on the cob. The kids love the whole meal and it has a great flavor! Heat all together and serve with cornbread and/or corn on the cob. Can top will sour cream and shredded cheddar cheese. I love this recipe, actually, this one is in my meal plan for next week. I prefer to mix this recipe with your "Chicken Enchilada Soup" recipe; so add corn and top with tomatoes, avocados, cheese, tortilla chips, peppers, etc. It feels more like a Mexican Dump Soup --- Love it!